Spring is in the air which means we are ready to get to work saving more dogs! 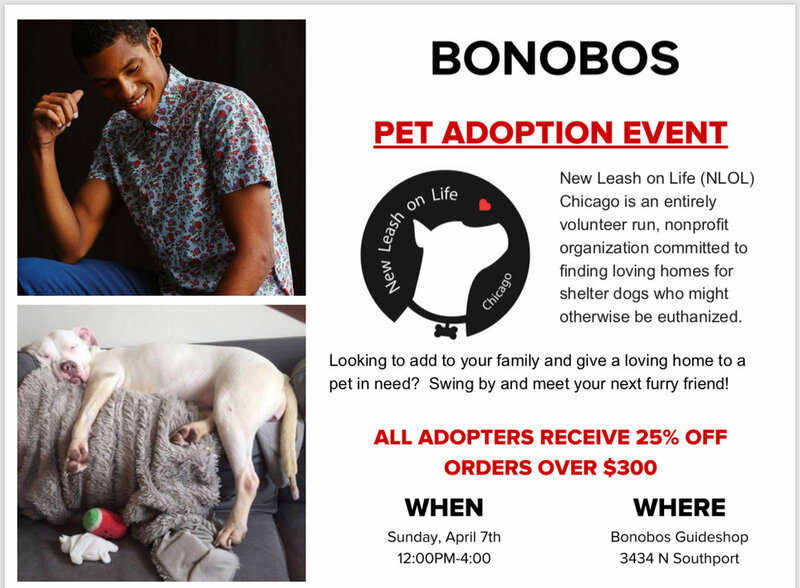 We need to raise a little "green" to pump up our funding and carry out our mission, so come on out and support your favorite dog rescue NLOL CHICAGO. Bowling tickets are limited to 30, but no need to bowl to come support us. Come have a cocktail and of course... donations always appreciated. We have collected great raffle items (autographed Mike Ditka Bears Jersey, Cubs tickets, NLOL merchandise, and much more). Bowling, pizza, pop/juice are all included in the $15.00 price. Cash bar available and great fun with great people. 100% of the proceeds go to saving more dogs. Buy a ticket soon, they will sell fast. Save the date!! Our wonderful friends at Billy Sunday have invited us back for Pups on the Patio 2: Doggo Boogaloo! We'll be out on their dog friendly patio on Sunday, October 14 to have a few drinks with old friends and maybe make some new ones and hopefully enjoy a beautiful fall afternoon. We can't wait to see you! Come out and bowl with us! Bowling and shoes, pizza, pop and juice provided. We'll have a cash bar and auction items to tantalize you. Family friendly! Kids under 11 - $5.00 at the door. Sorry, not dog friendly. Purchase in advance to let us know you are coming. Two Brothers is introducing their new brew "Dog Days Lager". NLOL Alum is hosting us! Come out and drinks some beer. NLOL will get $1 for every new brew purchased, and there will be DOGS! Come out and help us celebrate another fabulous year of dog rescue! All members of the New Leash On Life - Chicago family, friends, fans, supporters, etc are welcome! 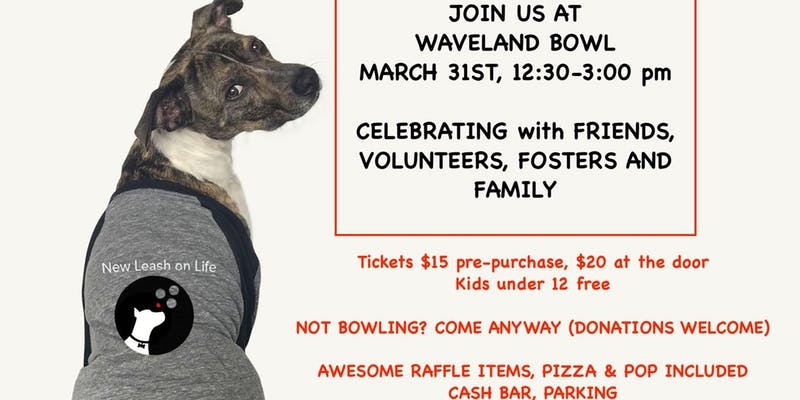 Reconnect with fosters, adoption counselors, volunteers, adopters, and DOGS! Lunch, Games, and Prizes provided. BYOB. The picnic will be at Thaddeus S. "Ted" Lechowicz Woods, 5901 N. Central Ave. on Saturday, September 30 from noon - 3 p.m. Enjoy special cocktails and snacks on the Patio at Billy Sunday (3143 W. Logan Blvd) while meeting adoptables and supporting NLOL! Sure, you can always buy tomatoes and cheese curds at the farmer's market, but on Sunday, September 17th you can also support New Leash on Life and meet some amazing adoptable dogs at the Logan Square Farmers Market. Stop by and see us between 10 a.m. and 2 p.m. at the intersection of Milwaukee Avenue and Logan Boulevard. Stop by our tent and meet some awesome adoptable pups at the Renegade Craft Fair on Sunday, September 10 between 11 a.m. and 3 p.m. The fair will be on Division Street between Damen and Ashland. Wash your pup and meet some of our adoptable dogs! Wet kisses are going to be a plenty! We are always looking for new volunteers! If you are interested in helping with transport or handling a pup. Fill out our volunteer application! If you would like to volunteer for this event by handling a dog or helping with transport, fill out the volunteer application and get on the list! Join Shamrock, Iggy, Miki and more at Felt on Sunday February 20th for a very special adoption event and fundraiser! Enjoy some delicious biscuits courteous of Bang Bang Pie, sip on your champagne, and spend your afternoon cuddling pups and shopping the fabulous Felt.